I was browsing the surplus store in town for art supplies, and this is what I came across, in between crayons and garden hoses. 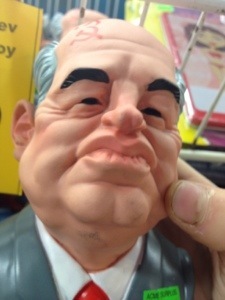 I really want to know the story of why these were created. I bet it’s hilarious and involves copious amounts of vodka. He’s even got a hammer and sickle birthmark or tattoo on his forehead. Those are hilarious! I want to know the story behind them too. I think you’re right that it probably involved lots of vodka. 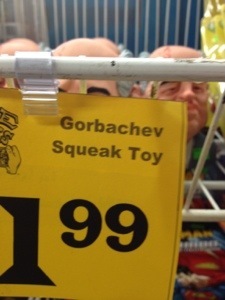 In Soviet Russia, Gorbachev squeak you!